Great credit today goes out to community member and Local Motors competition winner, FILSKI, who has become so inspired by the very nature of design process that he has taken his very own design and begun to move it in a Design Process of its very own. In the creation of the concept, FILSKI received 75+ votes plus comments from the community and he avidly used the checkup feature on the site to iterate the concept before submitting it in its final competition form. Then he waited. When the competition for which he submitted the concept was long over, and when the prototype build of the LM Rally Fighter had already begun, he quietly began the development of the B7 into a model. He did not settle for doing it in the privacy of his own studio, but rather submitted it to the overall community for public viewing and comment. 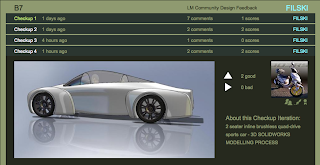 We at LM created the formal Design Process in order to move forward those designs whose potential had not been recognized by the community or their own creators. With the B7 that support was not even necessary, as its creator took this step without any assistance. Follow this great process in checkup and VOTE as FILSKI continues his groundbreaking development and community participation. He is a beacon lighting the way for the future of transportation designers.